Gyun-woo (Cha Tae-hyun) is having difficulty forgetting the sassy girl. One day he reunites with his childhood sweetheart (Victoria Song), an elementary school classmate from China who was often teased about her broken Korean. Gyun-woo marry her and goes through a honeymoon which no man would ever dream of. 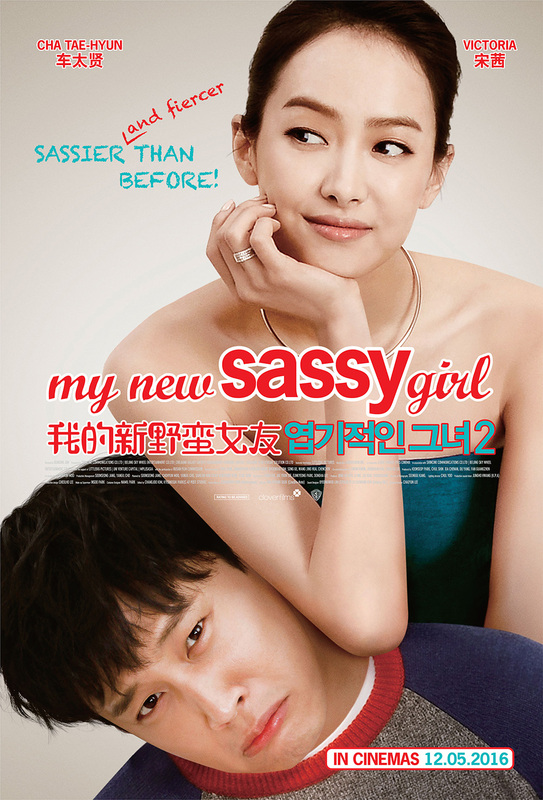 A sequel to the 2001 hit romantic-comedy “My Sassy Girl”, Cha Tae-hyun returns to reprise his role as Gyun-woo together with Victoria [member of South Korean girl group f(x)] as the new ‘sassy girl’. Before writing this review, I quickly browse through the 2001 film again, to see why this new film received so many negative comments. Victoria from f(x) is now the new sassy girl (or should I say wife?) in this film. With similar long straight black hair, it felt as if she was trying to imitate Jun Ji-hyun’s original character. She also has similar violent tendency, just that the sassiness is no longer fresh and new thanks to the increasing number of films with sassy female characters. Plot-wise, there were quite a few similarities that it almost felt like a remake. In both films, there are many re-enactment of different characters and plot. The original girl wanted to be a scriptwriter while here, the new sassy girl wanted to be an actress. Gyun-woo (Cha Tae-hyun) also seem to have the habit of sleeping in trains/ train stations and waking up at strange places. And the female lead always want him to do loud declaration of love. The first wanted him to present a rose to her in the middle of her class, here, she wanted him to declare it by drawing on the sand during his work trip. The film war campaigned to be the sequel of “My Sassy Girl” ,first aired 15 years ago in 2001. However, there were several films over the past 15 years that emphasized on either “sassy” or “girlfriend”. This includes Jun Ji-hyun’s Windstruck (我的野蛮师姐) in 2004 as well as China’s My Sassy Girl 2 (我的野蛮女友2) in 2010 starring Leon William and Lynn Hung. Check out My New Sassy Girl (我的新野蛮女友 엽기적인 그녀 2) Official Website! My New Sassy Girl (我的新野蛮女友) is out in cinemas on 12 May 2016. In all fairness, the film didn’t really tried to outdo the first (and I think they know it won’t). It felt more like they are trying to appeal to the Chinese market in China (after all, just 5% of their population to enter the cinema could easily made them laugh all the way to the bank). The first is one of my all-time favorite Korean movie, a classic which I doubt any sequel would be find it easy to surpass. I adjusted my expectation before entering the cinema, so I would say it is pretty entertaining (especially the part when she met his mother LOL!) and to a certain extent, touching (probably due to my personal experience). Enjoyed how you have been giving review for those less-watched movies. Good efforts, Miss Tiffany, hope to see more of it! Movie trailer looks like a fun and entertaining film to watch. Hopefully will manage to check it ou soon. I liked the lead pair. They look smart, sassy and good actors. Sounds ok. I don’t think it would be a movie I’d personally like to watch. Probably I’ve grown out of that period of my life! The first Sassy Girl is very famous, but I actually have not seen it at all. Not really a rom-com person. Do I have to watch the first before I can enjoy this part 2? I have watched both the Korean and the American version of My Sassy Girl as its one of the movies that started the Korean movies popularity in other countries. It would good to watch this one. I have watched the American “My Sassy Girl”. I think it was inspired from this version. I wish they just made a new film entirely. I share the same sentiments with you, why would you relive old memories instead of creating new ones with your new love? That’s just sad and a bit disappointing. Looks like a fun and entertaining film to watch. With the Philippines’ fondness for Asian dramas and comedies, I think this one will be another hit. I have heard about this movie before but I am unsure if I was able to watch it. I am not particular with Korean, Chinese, and Japanese movies but whenever I get the chance to watch it, regardless if what is its origin, as long as it entertains me, I am always on the go of watching it. I bet this part 2 will have something interesting that the previous movie has not included. So I hope it wouldn’t be receiving more negative comments just like how the former received. Romantic comedies are always a hit or miss unfortunately and when you add in a sequel, the results are usually less than good. It is a shame this movie is not very original, but I am sure people will still flock to see it.